Matudnila.com - A Cebu Events Blog: Orange Brutus marks its 30th year of Cebu's Local Hamburger food chain! Home Oragne Brutus Orange Brutus marks its 30th year of Cebu's Local Hamburger food chain! Orange Brutus marks its 30th year of Cebu's Local Hamburger food chain! Over 30 years of gaining success in Cebu's prime local hamburger chain. The company’s concern is expressed through the healthy and nutritious food it serves. 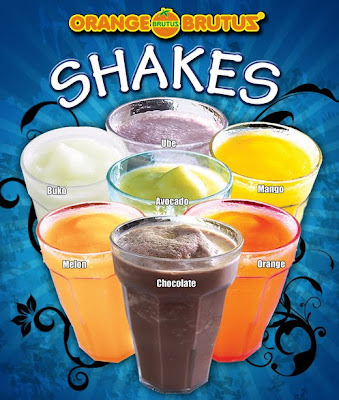 It only uses the freshest ingredients –Fresh fruits for the thirst-quenching fruit shakes, fresh vegetables for its entrée and garnishing. Burgers are charbroiled to ensure meat products are low in LDL or bad cholesterol and are never pre-cooked. Moreover, only corn oil, one of the healthier oils, is used for all the fried items. And here's snippet of Orange Brutus' success story. Two visionary young entrepreneurs admirably strove to find the silver lining. These entrepreneurs determined themselves to write a statement in Cebu’s food industry springing from a mind to revolutionize the food retail industry in the Visayas. And write they did and in bold letters too! This was how the first ever hamburger chain in Cebu – ORANGE BRUTUS was thus born. The hamburger was a relatively a novel food for the Filipinos at that time but the two entrepreneurs proceeded with the venture with astute boldness. The first store was opened in Colon Street(the oldest street in Cebu), Cebu City situated in Fairmart –the newest department store then. The first Orange Brutus shop was simple but brightly and attractively decorated. People delighted in the good and reasonably priced food. The charbroiled burgers and fresh fruit shakes were the main sellers. It has been 30 years since the entrepreneur founders opened the first Orange Brutus outlet. Over the years since then, more food products have been introduced including the best selling Sizzling Burger Steak and Chicken Brutus. Today, Orange Brutus has elevated itself to even higher levels with a known consciousness for the health of its customers. For Orange Brutus, the year 2010 is a year of triumphant celebration. From the humble downtown store it started with, it now takes pride in its 21 outlets spread all over metro Cebu and nearby towns. The most recent outlets are those in Robinson’s Cybergate and Naga, Cebu which opened just last January 24. Before them was the outlet in Gaisano Grand Mall Mactan which opened December 15, 2009. Other outlets are: Ayala Center Cebu; Ayala Cart; Carcar; Colon1;Colon2 (Trader’s Market); Elizabeth Mall; Fuente Osmeña; Gaisano Fiesta Mall; LapuLapu; P. Del Rosario; Ranudo Bldg. corner Ramos St. (Velez College); Shoe Mart; Mactan Marina Mall (MEPZ 1); Southgate Plaza (MEPZ 2); Cebu Doctors’ Hospital; Centro Mandaue; Maguikay Mandaue; and Argao. ORANGE BRUTUS @ 30 of local hamburger chain success posted in Cebu Events Blog. Orange Brutus, the Brute you love at Cebu Photo Blog. 1 comments: on "Orange Brutus marks its 30th year of Cebu's Local Hamburger food chain!" Great! If anyone has an experience about the chain, past or present, share it w/ us on Yummy Cebu!